© William King. Courtesy of Kraushaar Galleries, New York, New York. Photograph by R.H. Hensleigh..
Born February 25, 1925, Jacksonville, Florida; died March 4, 2015, East Hampton, N.Y. Here a tall thin man, dressed in a 1960s-style short jacket with wide-lapels, flare-leg pants, stiff triangular­ collared shirt, and thin tie, towers protectively over a shorter woman whose Twiggy-thin body presses through her mini­ length shift dress. The height difference between the two figures might almost make her a child, but her stylish heeled boots, brilliantly suggested by the sculptor with minimal means, increase her age. She may still be the child of the man. Indeed the gentle placement of his left hand on her shoulder, with his other hand in his pocket, and the clasping of her arms behind her back, suggest something of parental concern. King often draws on personal experience in his work. 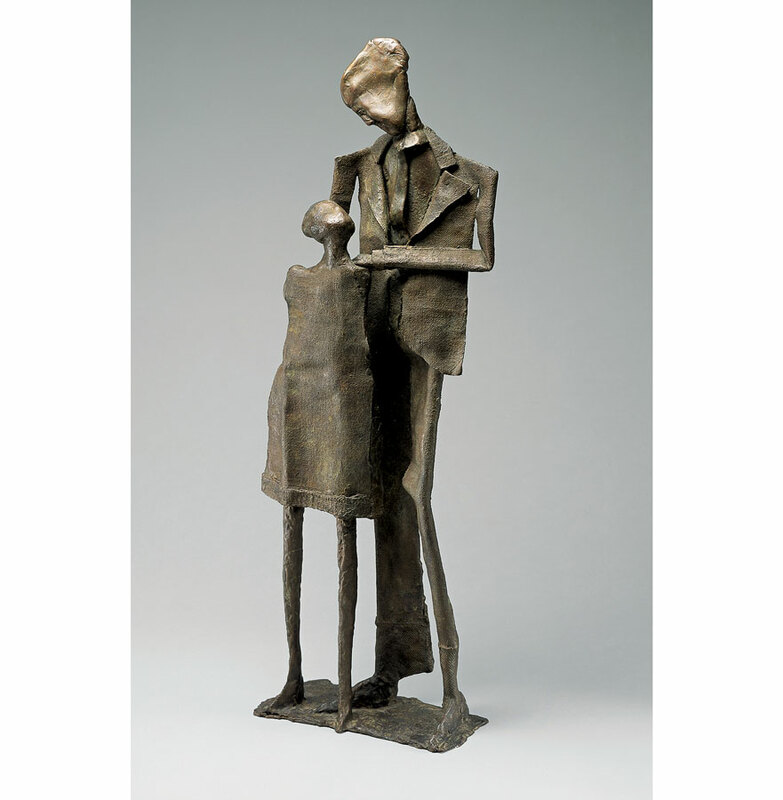 Male figures usually echo his own lanky build, and interaction between large father and small daughter occur in at least two other works (Learning, 1969, and Parent, 1976). But here the female is older and the possibility of additional readings is open to the viewer. Like Alberto Giacometti, King seems to capture his figures at a visual distance that the Swiss artist described as being just at the point where one recognizes an individual one knows. In King’s case, the suggested specificity of clothing, facial features and posture suggest that each figure is a particular individual, yet the inventively spare detailing makes them into modern urban types. King came to sculpture late. Born in Florida to a civil engineer father, he moved to New York and began art training at Cooper Union Art School (1945-48) after two early years of academic study at the University of Florida (1942-44). A one-year Fulbright at the Academia de Belle Arti in Rome (1949-50) expanded both his knowledge of earlier art and his technical skills in working in lost wax to be cast in bronze. His mature personal vision engages more with the ironic than with the tragic side of life. His acute eye for depicting middle-class folks in action parallels that of Elie Nadelman, whose work King first admired in a 1948 exhibition at the Museum of Modern Art in New York. He also admired Picasso’s witty ability to build figures from found objects. This found-object ability emerged especially in King’s later work with found wood and twigs. But even in The Pair, we see his ability to use the texture and folds of plaster-soaked burlap to suggest varied materials and amazing details of clothing construction.